Earlier this week, Telephone turned 10. On December 17, 2008, I released the first version 0.8 to the public. It was on Google Code—a go-to place for hosting and publishing opensource projects. Since then, it’s come a long way. The source code repository has been migrated two times: from SVN to Mercurial to git. The project hosting has moved from Google Code to GitHub. The distribution—from Google Code to the Mac App Store. My original goal for Telephone was to have a streamlined softphone that would be a native citizen on the Mac. As someone who wanted to use VoIP and loved Mac, I struggled with other apps being clunky and feeling foreign on the platform. Fast-forwarding ten years, and my goal still stands. Telephone has become a full-featured softphone while keeping its streamlined interface and its nativeness to the Mac. Over the years, Telephone was downloaded more than a million times. The vast majority of the feedback has been very positive, and that is what’s been keeping me going forward. I always wanted to dedicate more of my time to this app, and the introduction of subscriptions a couple of years ago finally made it possible. Making something sophisticated and full-featured while keeping it easy-to-use is a big challenge. That is what I’m trying to do with the app, and that is what people seem to like in Telephone. History shows a lot of examples of apps getting bloated as the businesses put more and more unneeded features into them only to justify another paid update. And that’s where Telephone Pro subscription comes into play, allowing the app not to be flooded with unnecessary features. I want to say thank you to all people who use the app! We often read these words in posts like that, but they are really true. Without you, without your positive feedback that inspires me, without your negative feedback that makes the app better, without your support Telephone wouldn’t have lasted this long. It’s been quite some time since the last release and I’m glad to present Telephone 1.4 to you. Dark Mode is a feature of macOS Mojave and Telephone now fully supports it. Historically, Telephone has been using built-in devices for playing and capturing audio unless a specific device is selected in preferences. This had been the expected behavior of Mac apps in the past and it changed over time. Now we expect an app to use the same audio devices that are currently selected in the system. This change has another practical advantage. The audio device for a call and the sound volume can quickly be changed from the sound indicator in the menu bar. Hold the Option key while clicking the sound icon to see the extended menu that allows selecting the input device. Introduced in the last release call history now has a context menu. Not only does it allow copying the phone number for a record but also deleting all call history records with one action. The standard keyboard shortcut Command-C will also work for copying phone numbers. Call history has received a facelift. The most important information—the names—is emphasized with a stronger font face. The secondary information is deemphasized for easier skimming through the history. Records can be deleted from the history without touching the keyboard. Swipe to the left to reveal the delete button. To make it easier to find call windows during conversations or incoming calls, call windows are now kept on top. This option can be turned on and off in the Call menu. In the Pro version, the app now supports up to 30 simultaneous calls. In the free version—up to three. QoS is a technology to give more priority to the voice traffic on the network. It makes it less likely for the voice traffic to be delayed or lost, which increases the quality of the phone calls. There are several types of QoS, and Telephone now supports the one that is called DiffServ QoS. This method works on the IP level of the network marking the packets with special numbers. These numbers can then be interpreted by other network devices giving higher priority to phone calls. There are two major types of traffic in SIP telephony: signaling (SIP) that controls call flow and voice (RTP) that transmits the actual voice in real time. Telephone marks packets with the following DiffServ DSCP values: SIP packets are marked with the value 24 and RTP packets—with the value 46. What should change now is that if your network supports DiffServ QoS, your call quality should increase under heavier network load. For example, when your internet connection is congested when downloading a big file. Hardened Runtime is a new security feature of macOS Mojave. This is another security layer—similar to App Sandbox—ensuring that the apps do only what they’re intended to do. The operating system isolates the apps from the critical system components, personal data, and other apps. In practice, this means that if an app is compromised by malicious software, it is automatically blocked keeping the system and personal information safe. Telephone has supported App Sandbox since its introduction in macOS Lion in 2011. And following the latest Apple security recommendations, the app now also supports Hardened Runtime. Telephone 1.3 has been released and I’m thrilled to tell you about this update. The long-awaited call history is finally here! It conveniently looks up names in your macOS Contacts, just as one of the app’s favorite features—contacts autocompletion—already does. Press Tab to switch the keyboard focus between the text field and the history. Press Return to make a call. Press Delete to remove the call from the history. With call history, it finally became possible to automatically close call windows reducing window clutter. In the free version, only the last three calls are visible. However, the last thousand calls are saved and revealed after purchasing Telephone Pro. Thank you to all the project patrons! Without you, this release would not be possible. I love working on Telephone and want to continue making it more and more useful to you and your business. The patronage allowed me to spend much more time in evolving the app but didn’t make it possible to work on it full-time, which I’d love to. The call history introduces the first pro feature to the app, with more to come. All patrons have automatically become Telephone Pro subscribers. As before, the subscription supports ongoing development, and now also unlocks the full call history. Another often requested feature was answering calls from the notifications, and it’s there! 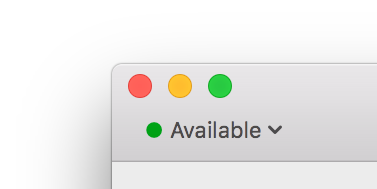 It is also possible to decline calls from notifications, but because of the macOS limitations, it is rather obscure. You need to click and hold the Answer button to show the Decline button as another possible action. And as before, just click the notification itself to activate the corresponding call window and bring it to the front. This feature also should help with a problem with multiple monitors or many open windows. Sometimes it can be hard to find the window of the currently ringing call, but the notification is always at the same place, easy to find and reach. The old icon was... old. Bought as part of an icon set back in 2008 it served its purpose for good ten years, until 2018. Again, thanks to the project supporters, I could finally spend some time on the new one, and here it is. Many of us are used to the black Telephone icon, so I kept the color. This is one of those small but convenient features. Just quickly glancing at the app window it is now clear if the phone line is currently available for incoming calls or not. Now, I’ll be focusing on other features that you often ask for: hide the Dock icon and show only the menu bar icon, calling scripts on new calls, new contact search that displays phone types, showing company names next to contacts, better phone number formatting, IPv6 support, and many others. Your feedback is always welcome! I read all suggestions and problems that you send me. Feel free to contact me anytime.